Fresh rumors are suggesting that Apple could be working on a small form factor tablet to share shelf space with the iPad and iPad 2. Specifically, a Taiwanese website called the United Daily News reported Tuesday that Apple has received samples of 7.85-inch displays based on the iPad’s 1024×768 resolution. White was careful to add that this “iPad mini” may only be “mini” in terms of its $199 price tag, but at that point a new iPad mini meme had been released into the wilderness, and rumor-mongers couldn’t resist the bait. Just do a search for iPad mini, and you’ll find story after story using White’s loosey-goosey language as substantiating evidence in support of a 7-inch iPad release. Bloggers were speculating on the possibility of a small form factor iPad in late 2010, almost immediately after it became apparent that the iPad was a transformational device. But the latest wave of speculation keys into anticipation for Amazon’s Kindle Fire, a 7-inch device that has renewed interest in the mini-tablet form factor, which had largely been abandoned by Apple competitors in the wake of the 9.7-inch iPad’s runaway success. Because the Kindle Fire is being celebrated as the first tablet with the goods to seriously challenge the iPad, it’s spurred a lot of talk that Apple could break into — and quickly overwhelm — the smaller tablet arena. “The Amazon Kindle Fire is catching consumers’ attention and pre-selling well because it is priced very competitively, not because it is just smaller,” says Desiree Davis of Resolve Market Research. Indeed, according to a recent Resolve study, only 9 percent of consumers are looking for a 7-inch tablet, while two-thirds want a 10-inch device. Davis has it right: The 7-inch form factor just isn’t that appealing to consumers. Screen real estate does make a difference in the mobile space, and a 9.7-inch iPad will always provide a more luxurious experience than a 7-inch Fire. But there are also three other reasons why chasing a 7-inch tablet doesn’t make sense for Apple. First, developing a product just to upend a competitor is not in Apple’s DNA. Apple strives to create new markets (or at least new product tiers) that it can own in dominant fashion. Just look at the iPod, iPhone, the MacBook Air, and of course, the iPad. No, none of these items were the “first” in their respective areas, but Apple innovated products so unique and with so much style, it almost seemed like these devices were entirely new inventions. Desktops, traditional notebooks and monitors are computing staples, yes, and Apple makes those too. But in recent years, the iPod, iPhone, Air and iPad lines have been Apple’s shining stars, carving out new niche segments that leave competitors playing catch-up. Bottom line: Apple has more to gain by creating new product spaces than chasing Amazon into the unproven territory of 7-inch screen real estate. Second, Apple has a carefully curated app store stocked with software specifically designed for the 3.5-inch display of the iPhone and iPod touch, and the 9.7-inch display of the iPad. Adding a 7-inch display to the line-up would create problems for app developers. Even though a 7- or 8-inch display could comfortably clock in at 1024×768, existing iPad apps may not look good (or be user-friendly, or feel quite as natural) on these smaller screen sizes. Just ask Android app developers about the difficulties of accomodating all the various screen sizes in the Android line-up, which includes a 3-inch mini phone, 4.5-inch uberphones, and tablets at 5, 7, 8.9 and 10.1 inches. Apple has avoided this “screen fragmentation” problem by offering only two screen sizes for iOS devices. A third size, care of a 7-inch tablet, would require app creators to explore a third track of development to reconfigure U.I. and other visual elements. “There’s a big difference between building apps for the iPad and for the iPhone. A 7-inch device would have its own set of activities and applications, [and be] more gaming and utility focused,” iOS developer Brian Fino said. Sure, iPhone apps could be ported to a 7-inch iPad, as has been done in the past with popular apps (like Facebook) that lacked an iPad-only option. But this approach isn’t graceful, and wouldn’t leverage any unique benefits of a miniature iPad form factor. 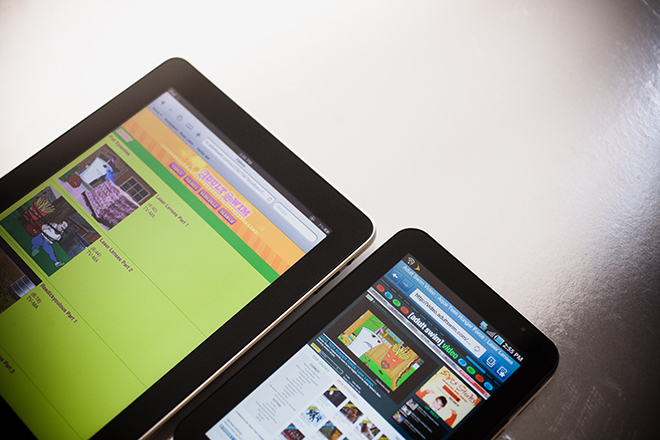 Third, the iPad already has a solid, ostensibly intractable foothold in the tablet space. The iPad basically is the tablet market. People want an iPad, not just any tablet, and competitors are resorting to dire price-slashing measures to carve out a slice of the tablet space. Oh, and here’s a bonus fourth reason why Apple won’t develop an iPad mini: Steve Jobs emphatically stated that 7-inch tablets are too small for a pleasant touchscreen experience. I think that if Apple does reach out to the budget market, it would use a similar approach to its iPhone strategy. It would dramatically reduce the price of the original iPad (maybe down to $200), slightly reduce the price of the iPad 2, and then offer a full-priced iPad 3. That’s just fanciful what-ifing, though. Sales of both the iPad and iPad 2 are still going strong at full price. Apple would only reduce their prices if it looked like user adoption would skyrocket thanks to bargain prices.